It’s Friday night. Indian summer is upon us. People are hustling by in their best weekend theatre-goer attire awaiting the evening’s performances all over Midtown West. “Ah, the theatah!” I say to myself, feeling on top of the world knowing that I, Sheena DiMatteo, would be getting into a Broadway show for FREE tonight! Ooh LA LA! Looking around at all the people who I knew had paid big bucks had me secretly gloating….. I gracefully chasse up to the ticket window, and smile “DiMatteo”…. a blank stare. I spell it, and again get a blank stare. Ok, “Sheena?” No such luck. “iDANZ?” ……Long story short, the publicist never wrote my name down and I had NO ticket. And I must announce, if there ever was a stickler, this guy at the box office window was it. I was NOT, (despite almighty Blackberry proof with MY name displayed clearly on the confirmation email) getting tickets if it was up to this Box Office Nazi. After a desperate pleading attempt with him and having him eventually close his blinds on me Wizard-of-Oz style at 8:02 PM, the couldn’t-show-up-at-a-better-time company manager swooped in on a magic flying steed and saved the day! “By golly, these people are trying to advertise your show, let her in!” And by the beard of Zeus, (thanks Ron Bergundy) there was a ticket in my hand! 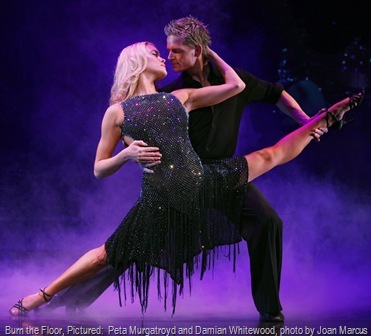 Burn the Floor is definitely not a Broadway musical. No lengthy storyline, no characters you care deeply about, no groups of songsters harmonizing loudly, or shocking plot twists, but there IS one thing it does have – the FIERCIEST, FIERIEST, SEXIEST, HARDEST-WORKING DANCERS on Broadway. Looking through the Playbill, it is funny to note how many dancers have “SYTYCD” plastered all over their bios. From the moment they enter the stage to the moment they take their final bow, and another bow, then another… these dancers bring it hard. It is ballroom at its best. “BTF” is divided into four sections: Inspirations, Things That Swing, The Latin Quarter, and Contemporary. The show flows pretty seamlessly through all four although it’s not hard to tell when we have left behind or entered another realm of Floor-Burn-ery. The cruise-ship style costumes, sets, and awkwardly placed singers unfortunately cheapen the show and add a level of theme park tackiness, but the CHOREOGRAPHY and DANCERS keep us coming back for more. Most of the show I am on the edge of my seat, especially during pulsating full-cast numbers such as “Magalena”, a Samba, and the crowd-pleasing “Proud Mary”, a high-speed jive which closes the show. As a choreographer myself, I am constantly trying to get inside the mind of director and choreographer Jason Gilkison. The gravity-defying dancers scarcely dance alone, constantly whipping each other around at lightning speed, their connections flawless beneath their perfectly tousled hair. Despite their verging-on-cheeseball costumes by Janet Hine, a few dancers manage to transcend the wardrobe of candy-colored matching Barbie frocks and display some true individuality. The rest manage to be pleasantly forgettable. Three of the females really catch my eye, and surprisingly, SYTYCD’s “Anya”, one of the show’s biggest marketing ploys at the moment, isn’t one of them. It is the blonde Amazonian beauty, Peta Murgatroyd, with her snake-like essence and legs that ooze out from underneath her like ribbons, that is the most stunning of all. One of her solos, which tosses her gracefully amongst six men, and BLINDFOLDED, is absolutely breathtaking. Then, to counteract her prowess is the compact little spitfire, Giselle Peacock who is constantly featured and center stage. Peacock dances like a tiny raging bull who’s been antagonized a bit too far! Thirdly, I must comment on my personal favorite dancer, Sharna Burgess, who is barely “featured” but snatches my attention the nanosecond she arrives on stage, every time. Put her in the corner and it’s still like there is no one else on stage. Tall and muscular with flowing black hair, she is the essence of HOT and the definition of commanding attention. Ok, let’s talk men. A LOT OF BOOTY SHAKING in tight pants, ladies! I vote that tight pants for guys come back in style immediately… not just for Sambas! “Pasha”, from SYTYCD does produce, and is thoroughly enjoyable, as are the rest of the men. I honestly don’t catch myself watching the men individually as much because they’re so good at showcasing their ladies! The guys work extremely well as an ensemble, the only one sticking out being the shortest of the group, Sasha Farber, who gets tossed into the air like a running cannonball at one point! By the end of the evening, we have watched one production number after another, and applauded the cast’s three or four self-given ovations- with tributes to their home countries. Burn the Floor might not catch the theatre on fire, but it does create some smoke. I’d gladly return and see it again just to fully appreciate the majesty of the dancers. With a little more concept and a little less tack, this show could really go places. But hey, let’s not forget that it already fan-kicked its way to Broadway… so kudos ballroom world! Welcome to the Great White Way. Click Here To Become a Member of iDANZ.com Today! The More Members We Have, The More We Can Make a Difference. It’s Free! Really very interesting site. Just want to see everything here.